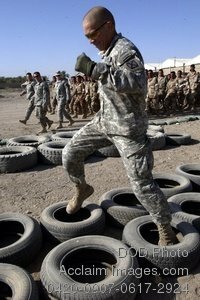 Description: Free, public domain image: American Soldier Demonstrating Obstacle Course Maneuvers for Iraqi Army Soldiers. U.S. Army Command Sgt. Maj. Michael Grinston demonstrates how to maneuver through an obstacle course for Iraqi army soldiers going through Iraqi army commando training at the Iraqi army compound in Mahmudiyah, Iraq, Sept. 29, 2007. (U.S. Air Force photo by Staff Sgt. Quinton Russ).